Is there anything better than fourth grade spelling words to give kids nightmares about English? Probably, but that shouldn't stop teachers and parents from at least trying. Fourth grade spelling words might not be as scary as Linda Blair in The Exorcist, but they are certainly one of the more frightening things students will encounter during fourth grade. Unlike movie monsters, students will conquer these words and stand victoriously over them come summer. A school district will usually have an established list of words which are recommended as new words for each grade level. 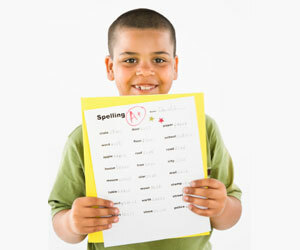 Learning new words should be like a big game in the fourth grade, challenging their minds without letting them know it. In the fourth grade, students are learning more and more how to write coherently, which means the more writing practice they get, the better. Encourage students to write stories or silly anecdotes with their new words, perhaps always building on the same story so that they have a short novella by the end of the year. The sillier the story, the more they'll be able to have fun learning new words. Suffixes: Look Out Behind You! Suffixes are parts of words that get stuck onto the back of other words words to change their meaning, and they are very important in English. A suffix can make or break a sentence. They can change verbs to nouns, rank words, and even rob them of their power. -less, -ness, and -ment - These suffixes are interesting because one of them drains a word of all its power, while the other two are used only because other suffixes can't be. Abbreviations used to be the cool thing to use. Nowadays, acronyms are more popular, but that doesn't mean that fourth-graders don't have to learn a ton of abbreviations. If they don't they'll never know what older books are saying, what month it is, or where they live. Streets, boulevards, avenues and other address elements have to be abbreviated. Months and days of the week have to be abbreviated. Almost all titles of people are abbreviated. To abbreviate them, students have to know the original words and chop out some of the meat to make them shorter. Abbreviation is just a convention everyone has to learn. Old conventions are spooky, but with practice, that spookiness can be overcome. The same thing goes for capitalization. In English, anything the writer thinks is important can be capitalized. That means, proper nouns, or one of a kind nouns, will always be capitalized no matter where they are in a sentence. On a spelling test, that's the only kind of capitalization that matters. Go convention! Silent letters are atavisms that reach back into the evolution of the English language. Why is the K in know silent? Why does the G in gnat go unheard? Why does wrench start with a W? The answers to these questions are irrelevant because the only way to even know they're silent is to remember that they are. Silent letters will be difficult for students. There's no way around that. Study abbreviations intrepidly! "Teaching Spelling in 4th Grade." YourDictionary, n.d. Web. 25 April 2019. <https://education.yourdictionary.com/spelling-and-word-lists/4th-Grade-Spelling-Words.html>.